While optimally designed for today's modern, shorter scale baritone guitars, EXP23's are also an excellent solution for deep, down-tuning on most standard acoustic guitars. 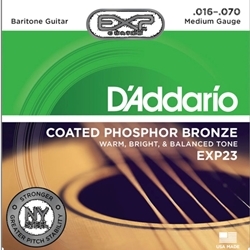 D’Addario’s EXP coated strings now feature plain steel strings and hexagonal cores made of our revolutionary NY High Carbon Steel. Envisioned, perfected, and manufactured by D’Addario in New York, this newly engineered, break-resistant, high-carbon steel wire delivers unprecedented strength and pitch stability. Combined with the highest quality wrap wire materials, precision drawn and micro-coated on our advanced proprietary machinery, each EXP set maintains that familiar uncoated tone while adding up to 4 times more life.